Designed to deliver a new level of versatility, functionality and performance, the Motorola DS9808 features a one-of-a-kind hybrid form factor that provides superior comfort and ease of usei n both handheld and hands-free scanning modes. 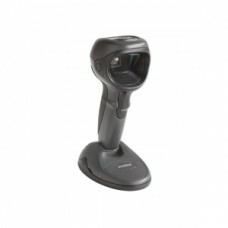 Inside, the DS9808 offers the latest scanning technology, delivering record swipe speeds for 1D and 2D barcodes, as well as the ability to capture images and signatures. Available in standard and long range models, the hands-free decode range on both can be adjusted to meet your needs, for example, to match EAS deactivation range or prevent inadvertent scanning of items nearby.